Everyone wishes to have their residence in the best location. And what can be a better location than a popular tourist destination? People love to visit these places because of their stunning natural beauty. The glamorous beaches all over the world are considered to be the most favorite tourist destinations, because of the enchanting beauty of the crystal-clear, blue water of the ocean and the white smooth sand. The city of Miami in Florida is a very popular tourist destination and is famous for its gorgeous beaches. The Sunny Isles Beach is one of the most beautiful part of Miami, where you will find many luxury condominiums. The luxury condos are the finest residences that one can expect or imagine. Not only it offers an excellent location, but also, their majestic appearances make them the best possible luxury abodes on earth. 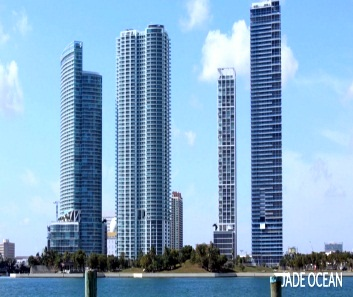 Jade Ocean, Sunny Isles is one such luxury condominium. This luxury condominium is located on the Sunny Isles Beach and the residents can remain near the beach, and the premier shopping areas, international airports, business centers, night clubs, etc. are close to this place. This magnificent condominium is designed by the eminent designer and architect Carlos Ott. It is a very popular and desirable condominium in the Sunny Isles area, and its splendid appearance makes it more special and attractive. 12. The kitchens have European cabinetry, granite countertops, glass cabinets, Miele and Sub-Zero kitchen appliances, etc. 13. The bathrooms have European faucets and fixtures, designer whirlpool bathtubs, large vanity mirrors, etc. The units in this luxury condominium are available for sale, and if you are desirous of buying a unit in this condominium, then you may visit the websites of various well-known real estate companies that offer the units for sale, and you can get all the required information there.